This past weekend was the Yin Yoga Teacher Training. We went over the Yang Leg Meridians. Remember these are only the sinew meridians. Most information on the internet and in books deal with the primary meridians. We are learning the sinew meridians. We want to do yoga to help people feel better or keep them feeling good. Applying the aspects of Qi and the meridians is the focus of Yin Yoga. Many Yin poses address more than one meridian so learning the sinew meridians is enough to enable us to create beneficial Yin Yoga classes. Knowledge of the other meridians can be used for acupressure and more specifically acupuncture. The sinew meridians are more of an area than a line and they can be accessed with movement. 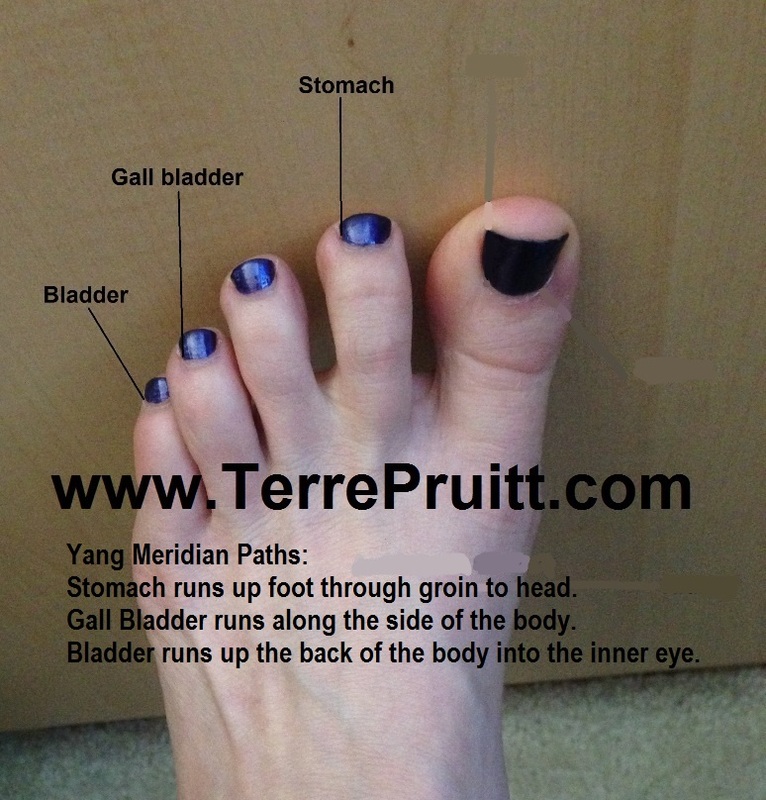 The Yang Leg Meridians we reviewed were the stomach meridian, the gall bladder, and bladder. I stated in my Jing Well Points Of The Feet the starting points of the Six Sinew Meridians. In my Yin Leg Meridians post I explain where the Yin Leg Meridians travel and end up. This post is about the Yang Leg Meridians. The stomach meridian starts on the lateral side of the second toe. Some information shows it encompassing the three middle toes, so the second, third, and fourth toe and that is why I have been saying that the sinew meridians are more of an area. The stomach meridian travels up the top of the foot, up the lateral side of the shin and knee. One branch travels up into the lower spine, and the other goes through the groin area up the front of the body all the way into the face, two points under the eye and one point in front of the ear. A quick note here, “lateral” is an anatomical term and it generally relates to the side away from the middle. Median is an anatomical term relating to the middle of the body. I probably should have stated that in my other posts because sometimes we tend to think of the edges of the foot as the outside whereas one side is medial and one side is lateral. The legs seem to be thought of as only having one outside (lateral) and one inside (medial), but it seems the foot is sometimes thought of as having more than one outside. Weakness of the stomach or a blocked stomach meridian might show up as spasms in the lower leg, sudden mouth dryness, eye issues – unable to close or open the eyes, or something related to digestion. There may be pain in the abdomen or constipation. Depending on how it presents it could be diarrhea. Other things related are halitosis, obsessive thinking, and GERD. The gall bladder meridian is on the lateral side of the fourth toe, travels up the foot to the lateral (outside) of the ankle, up the lateral side of the leg branching off at the hip area to the sacrum. From the branch point it continues up the side of the body, a branch travels to the breast area then up to the clavicle area meeting up with the branch that continued up the side. When it joins up becoming one again it moves up the side of the neck behind the ear. Above the ear it branches again, one branch traveling to the side of the nose and up to the outer eye and the other branch travels up to the vertex (top of the head). A blocked gall bladder meridian or a weak gall bladder could have symptoms such as knee issues – strain or sprain of the lateral aspect of the knee, inability to extend the knee, spasm of the area behind the knee. Pain in the sacral region or clavicle area. It could also be difficult to make decisions. Tight shoulders or inability to move shoulders may also present. The bladder meridian is on the pinky toe and travels up the foot where at the crease it splits into two branches with one going up the lateral side of the calf and ending on the lateral side behind the knee. The other one going up the back side of the calf up the back of the leg over the buttock up the back. At the lower part of the scapula (shoulder blade) it branches off, and that branch becomes two branches one going around the body under the armpit to travel up the front to the clavicle. The other moving up over the shoulder blade to the top of the shoulder. The branch that goes under the shoulder blade to the clavicle branches at the clavicle with one branch going up the lateral part of the neck up behind the ear and the other part going up more the front of the neck over the jaw up under the cheek to meet up with one portion coming over the top of the head and also to continue on to the side of the nose where it meets up with another portion coming over the top of the head. The meridian continuing past the “shoulder blade branches” – branches again above the shoulder blade with that branch traveling up to the top of the shoulder near the neck and the rest of it going up the back of the neck, up the back of the head, over the top of the head and down the forehead. At the eyebrow is branches and one branch goes along the eyebrow down the lateral side of the eye down the cheek to meet up with the branch that traveled up the cheek. The other branch continues down the side of the nose to meet up with the “cheek branch”. Again keep in mind that the meridians are not draw with fine pen points, they are more like a medium sized paint brush. The bladder meridian having a blockage or the bladder being weak could show as signs of difficulty with the little toe, heel issues, neck tension, pain along the path of the meridian, urinary issues – difficulty or excessive. We think of the Yang Meridians as traveling on the outside and/or back of the body, with the Yang Meridians traveling along the inside and/or front of the body. Again, just a generalization to help us know what meridians are affected with the Yin asana. It is so interesting to me that obsessive thinking is related to a weak stomach/blocked stomach meridian. Anyone else finding stuff like that interesting?